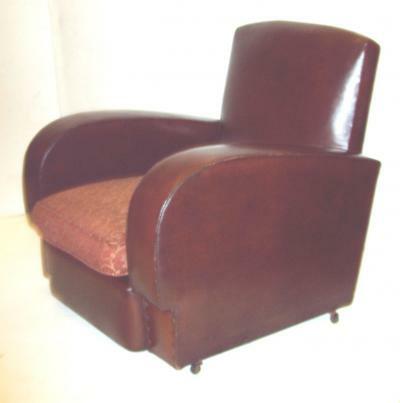 This is a very rare ,original 3 piece suite dating from the 1930's. It is upholstered in REXIN, which was a leather substitute.It is totally original including the fabric upholstery for the cushions.. The cushions are coil sprung. There is minor wear and tear.All 3 pieces have their original steel castors.We normally reupholster a suite like this in leather but I have never come across a suite in such pristine condition hence we offer it as it is. This is something for a museum or a perfectionist who wants original 1930's furniture. The price is for 2 chairs and one sofa. Measurements are for the chairs.